Alzheimer’s Disease Association (ADA) was formed in 1990 because of a growing concern for the needs of persons living with dementia and their caregivers. 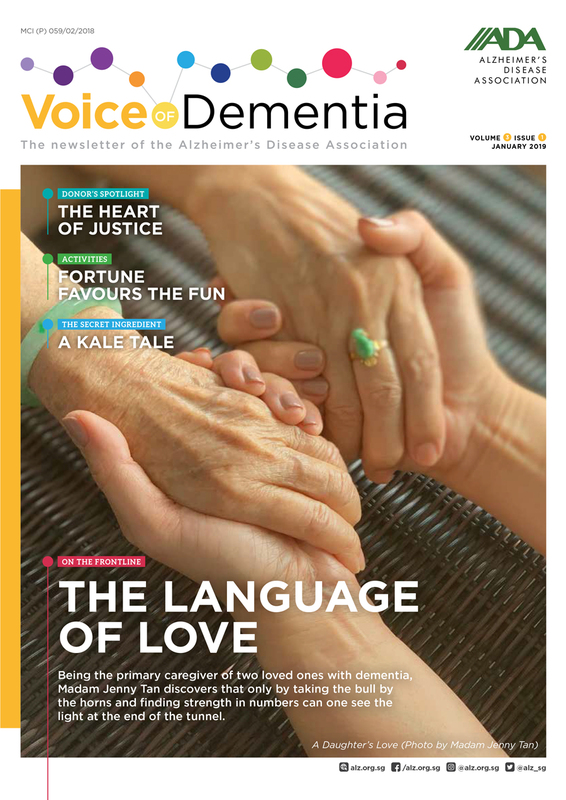 Through our work, the Association hopes to reduce stigma by increasing awareness and understanding of dementia; enabling and involving persons living with dementia to be integrated and accepted in the community; and leading in the quality of dementia care services for persons living with dementia and their families. Striving towards a dementia inclusive society through our four strategic service pillars; Centre-Based Care, Caregiver Support, Academy and Community Enabling, the Association aims to advocate and inspire the society to regard and respect persons living with dementia as individuals who can still lead purposeful and meaningful lives. ADA is registered as a Society [UEN No. S91SS0018J], gazetted as a Charity [Charities No. 0089], and is recognised as an Institution of Public Character [IPC No. 000304]. Outright donations to ADA are eligible for 2.5 times of tax deduction. The Association is also a member of the National Council of Social Service (NCSS) and Alzheimer’s Disease International. ADA was appointed by NCSS as a “Centre of Specialisation” since 2007. Towards a Dementia Inclusive Society. To be recognised as Singapore’s leading organisation in dementia care – a catalyst, enabler, educator and advocate – that inspires society to regard and respect persons living with dementia as individuals to lead purposeful and meaningful lives. Pursuant to the enactment of the Personal Data Protection Act of 2012, Alzheimer’s Disease Association has taken progressive steps to tighten governance of personal data acquired in the course of serving the community. We take personal data privacy very seriously and have sought the legal counsel of relevant government and private agencies to review and enhance compliance. As a non-profit, our limited resources will not allow us to achieve total compliance immediately. In the meantime, we seek the public’s cooperation and understanding in advising us of any possible oversight or improvement that can be addressed to safeguard personal data. Please write to us at dpo@alz.org.sg and address your concerns to the ADA Data Protection Committee.